Darryl Chatman, Animal Sciences alumnus and UM System Curator, speaks at the Fisher Delta Research Center Field Day in 2017. More than 1,000 guests attend this event each year. Darryl Chatman has had many educational and career experiences since getting his bachelor’s and master’s degrees in Animal Sciences at the University of Missouri. But it’s clear – his heart is still in the College of Agriculture, Food and Natural Resources. And today, as a Curator of the University of Missouri System, he says he talks to his mentors in Animal Sciences and around CAFNR now even more than ever. It was these mentors – Jim Spain in Animal Sciences and Tom Johnson in Applied Social Sciences – who helped him explore opportunities leading him to who he is today. Darryl always had an interest in agriculture, even before he came to Mizzou on a football scholarship in 1992. But majoring in Animal Sciences specifically had more to do with the people he encountered in his first years at Mizzou. Darryl received his bachelor’s degree in Animal Sciences in 1997, and went on to get a master’s in 2001. The hands-on opportunities at the various CAFNR Research Centers were a huge plus to the Animal Sciences program, Darryl says. After getting his master’s in Animal Sciences, Darryl headed to North Carolina State University (Dr. Spain’s alma mater) to work on his master’s in Public Administration, which he received in 2003. “My goal was to evaluate public policy in agriculture. I really liked doing that through the lens of being a scientist,” he says. After a summer back in Columbia working at the Mizzou meat processing facility, he entered a graduate degree program in Agricultural Economics and started applying to law school. Darryl soon was on a dual MS and JD track. “But once again my focus in law school was in agriculture,” he says. He concentrated his master’s studies on rural economic development with Tom Johnson, now an emeritus professor. Darryl enjoyed summer internships during that time at the Center for the Study of Rural America at the Federal Reserve Bank of Kansas City, and at Monsanto. After graduating from law school in 2008 (he received his master’s of science in Agricultural Economics in 2007) he went to work for Armstrong Teasdale, a law firm headquartered in St. Louis. In 2014, he was tapped by director Richard Fordyce to serve as deputy director of the Missouri Department of Agriculture. In 2016, he rejoined Armstrong Teasdale and started an agriculture and life sciences practice group. In 2017, he was tapped by the Greitens’ administration to serve as general counsel for the Missouri Department of Agriculture. Chatman is now the governance and compliance senior vice president for the United Soybean Board – he started in this role on Sept. 17. “Being a scientist, where you learn to apply the scientific method, is very close to what we do in law,” he says. “Getting to the heart of an issue: what’s your hypothesis, and what evidence do you have to support your hypothesis?” His background in Animal Sciences has always been key. Agriculture-related cases often come across his desk. When Darryl got the call that he had been chosen as a Curator for the UM System in 2017, he says he got emotional. The experience has showed him the vastness and depth of our university system – and changed his perceptions. He says he’s been amazed by all of the work each part of the system does – he’s also enjoyed learning about all of it. He feels Mizzou is moving in the right direction and has the right leaders in place – including CAFNR’s Vice Chancellor and Dean Christopher Daubert, who joined the college last August. Being a UM Curator has also brought Darryl back to his mentors in a way. Although he now has responsibility for the entire UM system, Darryl still enjoys exposing new audiences to thinking about agriculture and careers in ag. 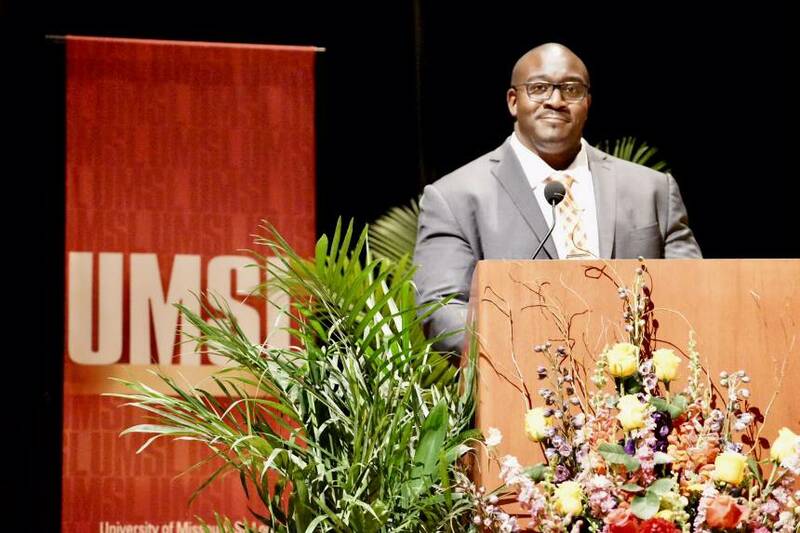 While pursuing his Animal Sciences graduate degree, he was a member of Minorities in Agriculture, Natural Resources and Related Sciences (MANRRS) – he’s recently spoken to that student group at both Mizzou and Lincoln University. While at the Missouri Department of Agriculture, he helped reboot the Life Sciences Quest program, bringing urban high school students to Mizzou for a summer academy to learn about degrees and careers in agriculture and life sciences. He spoke at the first session of that reboot in 2016, and gave a presentation on intellectual property in 2017. “That was a passion of mine; that city kids could have access to learning about agriculture on the life sciences side,” he says. He believes there are opportunities to work in agriculture for everyone. “I would tell them that ag is for you,” he says of urban students. “I think in rural communities, the message is that they can get involved in ag; whether from a row crop or livestock perspective, or developing new technology for John Deere, or working in a lab to develop new ways to feed the world. “I would go to the city kids and say, for example, that the biotech, animal pharmaceutical and brewing industries are important to Missouri. CAFNR can compete for students that want to go into medicine, chemistry and engineering – all those opportunities are available in agriculture. It’s clear Animal Sciences and CAFNR are still close to his heart, as is the importance of higher education.